Dancing men are designed for very young, preschool, children but can be used as a craft with slightly older children as practice of independent work, as they are so simple to complete. I took the face image and the hand images from Clker.com and so they have no copy write on them. The pdf page will give you four men. Each child also needs 2/3 of a sheet of paper or thin card for the body and limbs. Cut out the heads, the hands and feet circles from the PDF. The link for the PDF is at the bottom of this page! You can use the one from the photo or the one with the bible hero’s face. Fold an A4 sheet of paper into 3 pieces (like you would for a business letter) and then tear or cut along the fold lines. Taking one of the three pieces fold it in half longways, and then half again. Spilt along the fold lines so you have 4 long strips of paper. Concertina fold each strip and attach a hand or foot on the end facing outwards. With the larger piece of paper form a fat tube and affix the head and limbs to it as desired. 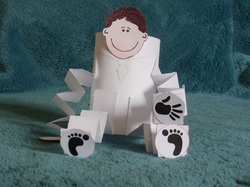 ***If you want to have the children decorate the man with clothes, fix on the head before forming the tube and then decorate, similarly the hands and feet can be pre-attached to the paper strips.